For those born February 9, 1971. 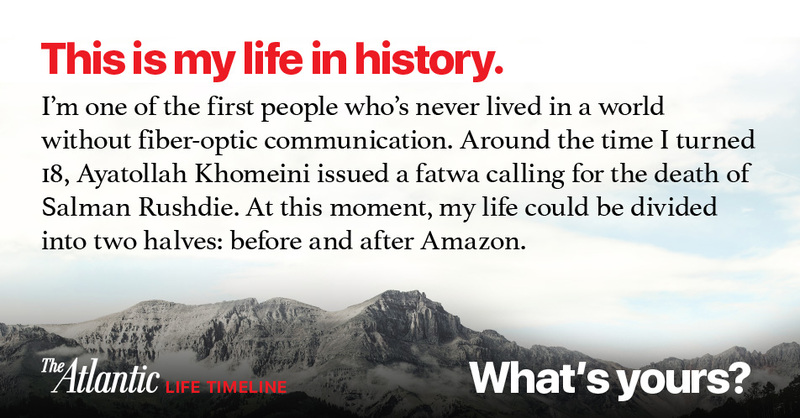 You're one of the first people who's never lived in a world without fiber-optic communication. In May 2015, Nicole Starosielski wrote about the underwater network of fiber-optic cables that supports the internet. Around the time you were born, the U.S. spacecraft Apollo 14 successfully landed on the moon. You were born in February of 1971. This year, The Atlantic celebrates its 160th birthday, making it 3 times as old as you. The year you were born, Sara Davidson wrote about the Rolling Stones' Grand Tour of Europe, shortly after the Beatles broke up. Revenge of the Nerds was released in 1984. Around your 18th birthday, Ayatollah Khomeini issued a fatwa calling for the death of Salman Rushdie. In March 2005, Jonathan Rauch wrote that Rushdie's The Satanic Verses began the War on Terror. At 18 years old, you saw the collapse of the Berlin Wall. “It was thought that all borders between men had similarly disintegrated, and we were all destined to be free and empowered individuals in a global meeting place,” wrote Robert Kaplan 20 years later. Your life can be divided into two halves: before and after Amazon. In March 2016, Ian Bogost wrote about the next stage in Amazon's commercial revolution. In 2001, Amy Poehler, who was born the same year as you, became a cast member on Saturday Night Live. In February 2015, Sophie Gilbert wrote about the optimism and open-heartedness of Parks and Recreation's fictional Pawnee, Indiana. When you turned 39, you saw the rise of the Arab Spring. People across the world rediscovered the power and peril of revolutions, as Laura Kasinof found in Yemen. By the time you turn 58, humanity's water requirements will exceed its supplies by 40 percent. In May 2012, Stewart M. Patrick wrote about the Intelligence Community's report on global water scarcity, and the plan to combat it.